Arabesque paper with Priestess of Venus pouring libations, under bower supported by doves and suspended crossed arrows. 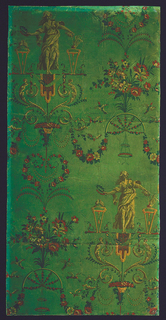 The figure stands on a lambrequin, with floral scrolls, floral swags and bead swags, and floral bouquets. Printed in multicolor on green ground.